More than 1 in 6 people in the United States are poisoned by adulterated food each year, and more than 3,000 people die a year from adulterated food (which the CDC states is more likely 30 times this number due to under reporting and unconfirmed cases of disease). These cases of preventable diseases cause many other significant impacts on the public health including the burden of cost to health care and lost wages, and they also have a significant impact on the economy of the food industry. 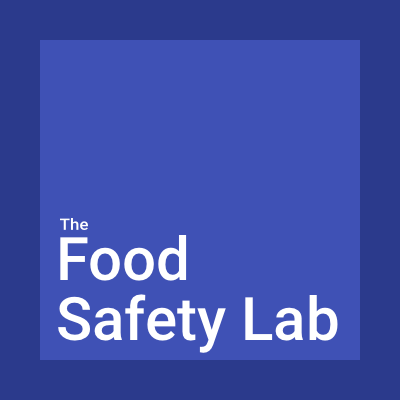 The food industry has a public health responsibility to improve the prevention of foodborne diseases from its foods, and the new Food Safety Modernization Act (FSMA) will significantly enhance this prevention through regulatory enforcement of preventive controls of food safety hazards during food manufacturing. Until such time food companies can prevent all adulteration of food, one of the most effective public health tools for prevention of foodborne diseases in the United States is the surveillance for foodborne disease outbreaks and the identification of the adulterated food/product. Public health agencies have successfully worked for many years to improve food safety through identifying the causation of outbreaks of foodborne diseases, initiating food recalls (the intervention), and subsequently preventing the further consumption of adulterated foods. The Centers for Disease Control and Prevention (CDC) in collaboration with States and the Food and Drug Administration (FDA) leads this effort as part of its broader public health mission of surveillance and epidemic investigations of all new disease outbreaks (e.g., Legionnaires disease or Ebola). These efforts have prevented numerous additional cases of illness and death as evidenced by the more rapid decline of reported foodborne illnesses associated with each outbreak once the source of the adulterated food has been identified. Many outbreak investigations identify a link to a specific commodity of food like spinach that then lead to subsequent recall and reduced consumption (over time) of that specific food/product; a positive intervention step. However, because consumers may only hear about the commodity when they become aware of an active CDC investigation (before a branded product or commodity has been identified) or after an FDA recall, they often act out of sense of caution, and avoid all such food/product types leading to significant loss sales and consumption of a whole category of brands of the same commodity. This has been the case for most outbreak investigations, but more significantly during the peanut, spinach, and green peppers (tomato) outbreaks in the last decade. The cost in lost sales to the food industry just for these three outbreaks alone was in the billions. Another important issue in the process of food recalls used as a means for public health intervention is with the communication of the recall information to the public. The primary purpose of the communication to the public is to prevent the further consumption of only that specific food or product identified as adulterated/recalled. 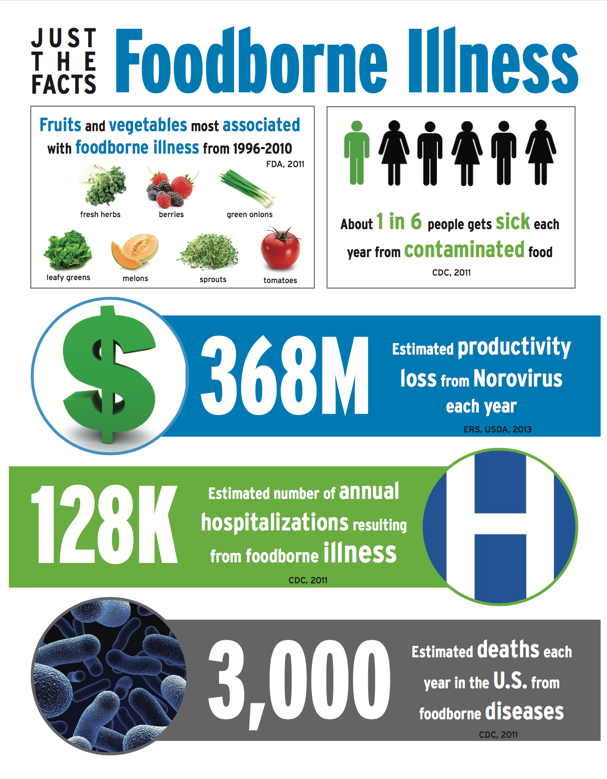 Often times when foodborne disease outbreaks are large (covering several states due to volume of distribution), many consumers do not hear of the investigation or recall who actually have the specific recalled product in their possession, and these people continue to consume the food/products likely leading to more cases of foodborne disease after the source of the outbreak is known. 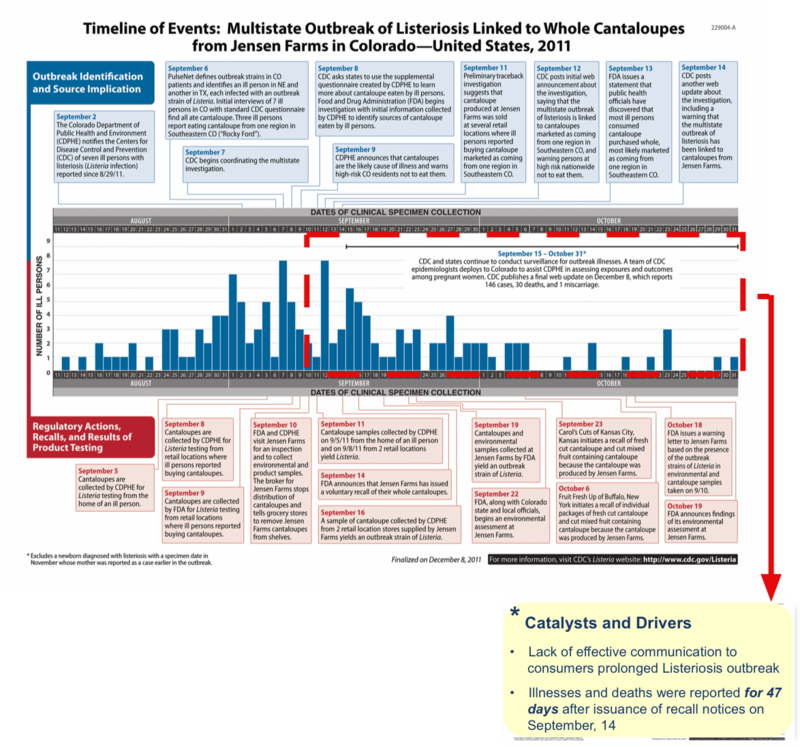 Take for example the multistate outbreak of Listeriosis linked to whole cantaloupes from Jensen Farms in Colorado, United States in 2011. Without going into the details of how this outbreak occurred (some of which is still speculative), cantaloupes were linked to 147 illnesses and 33 deaths (and one miscarriage due to the illness) in 28 states (CDC, 2012). The CDC and FDA reported that the source of the outbreak was cantaloupes from Jensen Farms on September 14 and provided notice via their web site and the national news of a voluntary recall of this product (telling consumers to inspect and not eat these cantaloupes). However, the outbreak continued and cantaloupes continued to cause illnesses and deaths 47 days (see Figure below; red arrow indicates when the source was known) after the announcement of the likely source of the outbreak (whole or fresh cut cantaloupes linked to Jensen Farms sold via various retail establishments for example). Could these illnesses and deaths have been prevented (yellow line) with better communication to consumers that had the adulterated cantaloupes from Jensen Farms in their homes? Sadly another outbreak was reported with over 141 illnesses in 20 states, 31 hospitalized, and two deaths, from cantaloupes again shortly after the Jensen farms outbreak; this time due to Salmonella Typhimurium (CDC, 2012a) with a similar Timeline of Events curve. Some continuation of foodborne illness cases during an outbreak of foodborne diseases are also likely due to slow removal of recalled foods/products from retailer store shelves. Although many major retail food chains have internal recall systems to alert their stores of foods/products that must be removed from consumer purchase, thousands of non-chain associated grocery and other food retail stores, including the new wave of retail food service and sales at gas stations across the United States, do not have sophisticated recall systems to track, identify, and provide notice that the retail establishments should stop selling recalled foods. For example, when PHI members were facilitating a session on foodborne disease outbreaks at the last Food Safety Summit in April 2015, retail grocery stores in the Baltimore, MD area were still selling Blue Bell Ice cream with the exact code dates of the recalled ice cream that was recalled and reported to the public in January 2015. Thus a recall monitor tool for consumers could also benefit food retailers who cannot afford sophisticated recall systems. The challenge to public health then, is how can we more precisely improve communication of a food recall to the public. First, we must better associate the recall specifically to a consumers purchases of the recalled food/product to increase the reduction of consumption of only that food/product (also likely to shorten the outbreak). Second, we must improve the consumer confidence with this recall specificity to their purchased foods thereby increasing trust of related foods/products and protecting sales of similar foods/products. PHI believes that these challenges can be resolved by directly linking a specific food/product and its manufacture date/lot code to a national recall notice by FDA (which is what the FDA uses to trace an adulterated product to its source and initiate a national recall) using software and mobile technology (smartphones/tablets and smart devices, i.e., internet of things). This technology could also, in the future enable an earlier warning to consumers (e.g., for very high risk products like baby foods or formula and/or vulnerable populations of consumers) even before a national recall is initiated; as CDC has high confidence in the outbreak investigation data (e.g., using new technologies like whole genome sequencing). Although several mobile computer app companies have attempted to develop and market mobile apps to do just this type of monitoring and alert for consumers, the biggest drawback of these apps is that users are required to scan each individual food/product bar code for each product they buy or have in their possession. Likewise, all of these apps only scan the FDA recall list once at the time of scan (with a charge per scan model) or requires the user to go to the FDA web site and look for the recalled item on the daily list of recalled foods. Several retail grocery loyalty programs propose to alert members of recalled food products they have purchased, however the programs require membership (excluding purchases by consumers that shop anywhere else in addition to or instead of that retail establishment; which is common), the user must link their purchases at each visit to the store at the time of their purchase via scanning their loyalty card or smartphone code (reducing efficacy of capturing all products when they forget their card/phone app), and the recall alert to a customer IF they only shopped at one retail location and scanned their card/phone diligently each shopping visit is sporadic and usually only via an email or phone call recorded message. PHI proposes development of a recall monitor computer program application for mobile technology for consumers to enable active monitoring of FDA recall notices related to food safety. The proposed innovation would provide value to consumers, food retailers and government agencies in two ways. First, consumers and non-chain retailers would quickly learn about recalls for products they have in their homes or on their store shelves and, thus, unnecessary illnesses and deaths would be avoided. A more effective recall tool would also reduce costs to government agencies and the food industry as recall communications and consumer actions become more precise to only the food/products associated with the outbreak and as outbreaks resolve more quickly. It might also help Government "speed up" outbreak investigations. CDC. (2012). Multistate outbreak of Listeriosis linked to whole cantaloupes from Jensen Farms, Colorado. Centers for Disease Control and Prevention Outbreak Highlights. Available via internet at http://www.cdc.gov/listeria/outbreaks/cantaloupes-jensen-farms/index.html. CDC. (2012a). Multistate outbreak of Salmonella Typhimurium infections linked to cantaloupe. Available via internet at http://www.cdc.gov/salmonella/typhimurium-cantaloupe-08-12/index.html. Marler, B. (2012). Publisher’s platform: ode to the microbiological data program. Food Safety News. Available via internet at http://www.foodsafetynews.com/2012/08/publishers-platform-ode-to-microbiological-data-program/. Flynn, D. (2012). Deadly Listeria Outbreak Focus of Federal Criminal Probe. Food Safety News. Available via internet at http://www.foodsafetynews.com/2012/08/deadly-listeria-outbreak-focus-of-criminal-probe/?utm_source=newsletter&utm_medium=email&utm_campaign=120815.